The best Avett Brothers songs (and there's a lot of them) work on a couple of different levels. Lyrically, they hit the thicket of your senses like a knockout blow from Floyd Mayweather Jr. while their haunting melodies invade your soul like a long lost love. 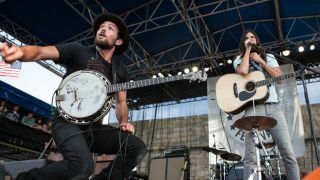 There's no shortage of either quality on The Avett Brothers' forthcoming Magpie And The Dandelion (due out October 15th), their third collaboration with producer Rick Rubin and one that follows their last album, The Carpenter, by just one year. In the above video, Seth and Scott Avett talk about the emotional resonance of one of the album's standout tracks, Morning Song, an absorbing and rousing folk-rock ballad that defty mixes melancholic rumination with steadfast optimism. In the clip, the brothers recall how a collection of friends and family members contributed vocals to the song's epic finish, including one beloved aunt who recently passed away from cancer - but not before she had a chance to hear the song. For a longer preview of Morning Song, you can click on the Soundcloud file below. And you can pre-order The Avett Brothers' Magpie And The Dandelion at this link.